If you follow us on Facebook and Twitter you’ll see important messages about YES on Proposition 10 — an excellent way to take action at this very moment is to take a minute or two to CLICK ON and SHARE a few of the memes and message we’ve posted. As you know, the reach grows tremendously when you share posts with your own networks. 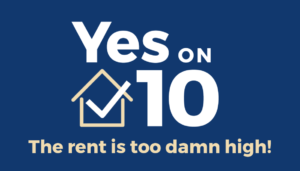 Here are a few excellent Prop 10 posts to share around. California is facing a crisis of housing affordability. Factoring in the cost of housing, California has the highest poverty rate in the country, despite being the 5th largest economy in the world! Of California’s almost 6 million renter households, over 1.7 million are “severely overburdened” by rent, meaning they pay more than 50% of their income toward rent. And, more than 1/4 of the entire homeless population of the country resides in our state! 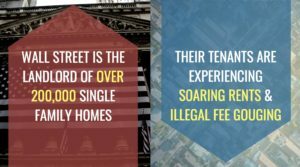 Skyrocketing rents are so bad that for every 5% rent increase in Los Angeles, 2,000 more individuals and families find themselves on the street. California tenants can’t “wait” for more affordable housing stock to be built; renters need more protections, like rent control and just cause evictions, now! Interested in getting involved in our chapter’s Housing Justice Committee? Keep an eye out for volunteer opportunities, or email housing@dsasb.org if you’re interested in joining! 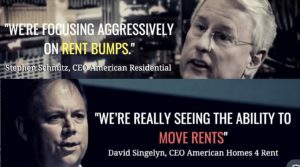 “Rent bumps.” We don’t consider a $1500 rent increase a “bump.” We don’t consider displacement of seniors, families and long term residents out of our communities a bump.